March 3 is Hina Matsuri, also known as “Doll’s Festival,” “Girls’ Festival,” or Momo-no-Sekku (Peach Festival). On this day the Japanese pray for the happiness and good health of girls. The main feature of this celebration is a set of dolls, called hina ningyo, which represent the emperor, empress, and members of their court. 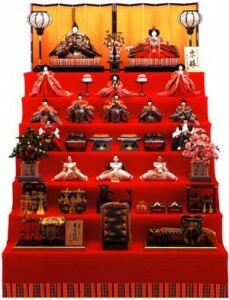 Depending on the number of pieces, the dolls are arranged on five- or seven-tiered platforms, with the emperor and empress positioned at the top. The dolls are dressed in traditional court wear from the Heian Era (794 to roughly 1185), with the empress donning an impressive costume called juuni hitoe (twelve-layered ceremonial robe). Families display the dolls at home in February and pack them away the evening of March 3. Superstition dictates that if the dolls are left out after March 4, the daughters will marry late in life. In New York, Japan Society celebrates Hina Matsuri with a sold-out festival Sunday, March 4. Families will learn about this Japanese tradition through song, dance and storytelling with educator Michiyo Kigawa. There will be festival-related snacks, and children and families will create a variety of hina dolls to take home. Although this event is sold out, families may register for the waitlist at Japan Society at 1:00 p.m., an hour before the program begins. For more information, visit Japan Society’s website. For more information about Hina Matsuri, click here. Previous Previous post: Examining Japan "One Year Later"
Next Next post: Gohan Society Fundraiser "Thinks Outside the Masu"